The Hearst staff and 14 UC Berkeley freshmen have co-curated a global selection of objects that depict human faces in different ways. 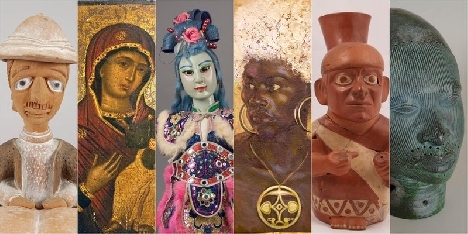 The exhibit asks: Why and how do crafting traditions of the world so often incorporate human faces, and how do people respond to those faces? Objects such as West African helmet masks and Roman sculpture illustrate varying conceptions of the ideal face, while Japanese tobacco boxes and ancient Peruvian portrait jars raise the question of what a facial expression can mean. Additional objects, including Chinese bamboo figurines and Caroline Mytingers paintings of Papua New Guineans, represent the contrast between portraying faces of ones own ethnic group versus those of another. Visitors are invited to examine the way they themselves depict and interpret faces in their everyday lives. This timely exhibit cultivates critical thinking about crucial issues such as stereotyping, representation and misrepresentation, and snap judgments. Alongside the exhibit, the Hearst Museum will be continuing its monthly Lounge Lecture series. These lectures, hosted in the cozy Lounge of Anthropological Discoveries, will focus on topics related to the exhibit and give visitors the opportunity to learn and discuss in an intimate and casual space. Featured speakers include Ken Goldberg, who will speak about the history of the uncanny, and Paul Koudounaris, who will speak about global death and funerary practices. In addition to lectures, the Hearst will also be hosting a variety of hands-on and performance events ranging from caricature drawing workshops to Maori song and dance demonstrations. Wednesdays, Fridays, and Sundays, 11 a.m. to 5 p.m.
Thursdays, 11 a.m. to 8 p.m.
Saturdays, 10 a.m, to 6 p.m.